Debelius angelfish larvae (Centropyge debelius) were raised from captive-spawned eggs at 77-79F on wild copepods and artemia. The larval duration was 110 days. First record of Debelius angelfish culture. 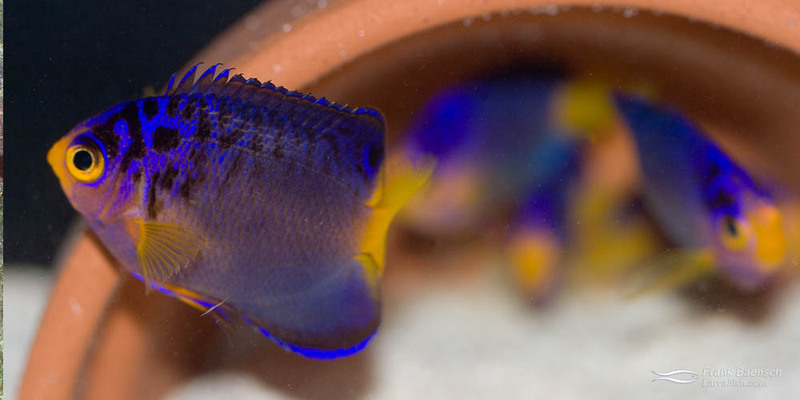 The Debelius angelfish (also know an Blue Mauritius angelfish) is and an exceptionally rare and gorgeous fish known only from Mauritius, Aldabra, Reunion and the Seychelles Islands. It inhabits outer reef drops and vertical walls at depths between 50 and 100 meters. Only single individuals have been observed to date, which may mean that that the principal breeding populations are located even deeper. The few individuals that have been kept in aquariums adapted well with or without live rock and thrived on conventional foods. The species grows to about 4″. C. debelius was first discovered by Helmut Debelius in 1988 and described a short time later by Richard Pyle in 1990. Left: A pair of Debelius Angelfish (female below male). Right: A 120-day-old juvenile Debelius Angelfish (just past metamorphosis). Debelius larvae proved to be very difficult to raise compared to other Centropyge . Like the adults the juveniles are very robust and require cooler water temperatures (less than 77 F over long periods). The C. debelius larval period lasts a minimum of 110 days, the longest larval phase of the 14 pygmy angelfish species cultured to date (2017).